Well, I thought I had experienced it but no no I hadn’t. Yesterday evening marked my first “storm”. I have been thinking “oh goodness will we ever have a day without rain?” And then yesterday evening happened. I have never in my life seen such intense rain for such a prolonged period of time. It was actually quite magnificent. Just sheets and sheets of rain fell for hours, turning or roads into muddy slip and slides and our walking paths into rivers and waterfalls and anything that was dry was completely drenched. We lost power for about 40 minutes and by a stroke of luck I peaked my head outside right as my neighbours were heading up to the institute and was able to get a ride and avoid a bit of rain. I certainly am getting used to the rain however I am not loving it. Constantly being wet and feeling like a drowned rat (whether it is caused by rain or sweat) is definitely a feeling I am becoming more comfortable with, however I am not sure if I will ever fall I love with the feeling. Unfortunately, there was so much water involved I was not keen on taking my electronics out to take some pictures and then I became so pre-occupied with getting into dry clothing that I didn’t take a drowned rat photo either. But don’t worry I am sure there will be many more opportunities to get one. 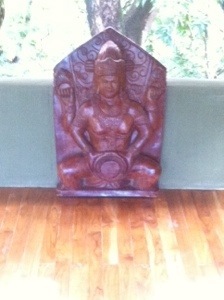 In the meantime, here is another photo from the yoga institute. I hope everyone is having a lovely Monday. Especially those of you who have the day off. This entry was posted in General, Yoga and tagged Costa Rica, Nosara, rain, storm, yoga, yoga teacher training by healingginger. Bookmark the permalink.